Fugro has taken delivery today of the first of three Fugro Offshore Coastal Survey Vessels (FOCSV) being built by Damen. The first of a new class, the Fugro Proteusis a compact, surveyship capable of undertaking a wide range of survey, monitoring and inspection operations. The vessel is designed for a variety of survey and inspections duties including light geotechnical work, environmental baseline surveys, monitoring and inspection, and moonpool deployments. Diesel electric propulsion delivers excellent economy at all speeds. 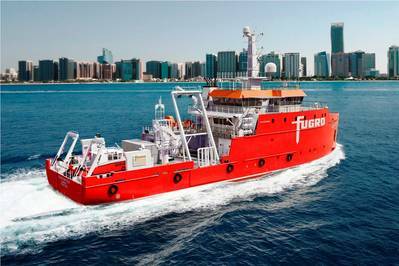 Fugro Proteus is the first of three survey vessels ordered by Fugro for delivery in 2014. Each will be operating in a different part of the world and so they have been adapted for the individual environments in which they will work. The operating company is a specialist in the acquisition of the full spectrum of survey data and so the vessels have been tailored to be adaptable for a wide range of tasks. Fugro Proteus is the first vessel to be built directly by Damen for Fugro. However the two groups have worked together on a number of refits in recent years, and in the process have built a relationship based on trust and mutual understanding.